← The Whitsundays New Resorts. Instantly becoming a firm European favourite among its visitors and celebrities alike, Abaton Island Resort & Spa impressed with its fine gastronomy, a delightful spa and above and beyond service. And for the Cretan five-star’s opening on the 20th of April this year, there is much more! Read on for details on accommodation and dining upgrades as well as amazing new facilities. The boutique resort’s ultra chic accommodation is scattered across 360m of dazzling coastline. Each of the 152 rooms is uniquely designed and 71 of them come with private pools. Luxury services, including a personal concierge, fulfil every guest’s wishes. 2019 steps up accommodation options even further. The Luxury Seafront Guestroom with private pool, Honeymoon Suite and Loft Luxury Seafront Guestroom with private pool will all have heated pools! Meanwhile, Villas will benefit from a double upgrade, being blessed with outdoor Jacuzzis in addition to heated pools. 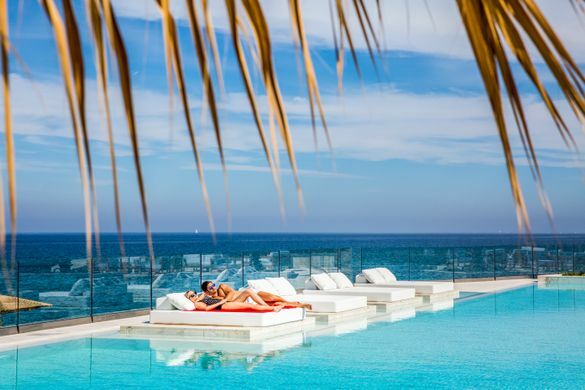 Abaton’s centrepiece hosts a swimming pool, poolside waterfall and luxurious sunbeds to soak up the sun on. This year, the main pool will also become heated! And as if this, along with Abaton’s amazing spa with Turkish hammam and fitness space, wasn’t enough, 2019 sets the bar higher! Facilities will be extended with a business centre, a high tech play zone for teens, a private karaoke room and the addition of water sports. From this year on guests will also be able to enjoy open-air movie nights and arrange fairytale weddings in the resort! Five waterfront restaurants offer guests the freshest sushi, finest steak and local delicacies. The new addition this year will be the a la carte service alongside the main restaurant’s lavish buffet. Guests will be able to enjoy the beach like never before with two brand-new piers and the opening of Buddha-Bar Beach! The world-famous Buddha-Bar brand offers a unique lifestyle experience, mixing flavours of the Middle East and the Mediterranean, in prestigious locations such as Mykonos, Abu Dhabi and Mauritius – and Abaton’s perfect location is next on the list! It’s tough to improve on perfection, but that’s exactly what Abaton are doing in 2019. So be sure to see it all for yourself and book now at ​abaton.gr. Bask in modern seafront accommodation spread over 360 m of coastline. 152 minimalist-chic rooms come with sea views, a balcony or patio, and luxurious amenities. 71 rooms have pools. Swim-out rooms lead directly to a shared pool. 5 restaurants offer authentic ingredients from land and sea. Make the most of your stay at the piano bar, beach club, fitness centre, tennis court and boutiques. Natural interior design and exceptional services promise an amazing stay in Crete.